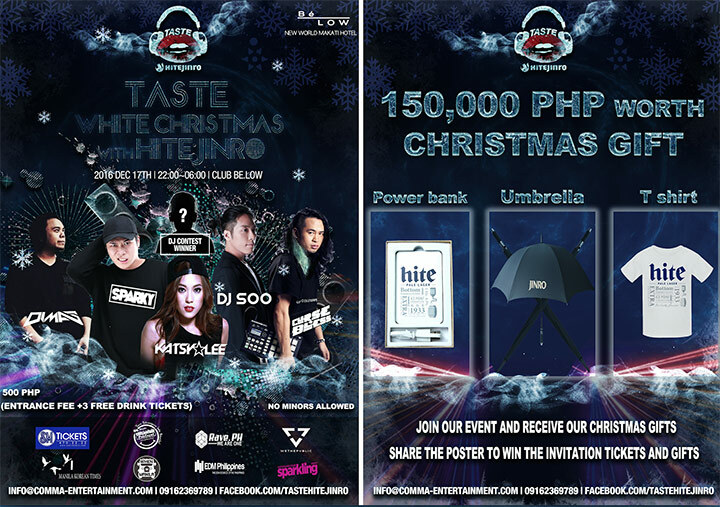 This December 17 HiteJinro (Korea’s number 1 Liquor Brand) is bringing winter to Manila by celebrating Christmas with a party at Club Be.Low at the New World Makati Hotel. HiteJinro will give away over 150,000 PHP worth of early Christmas presents to visitors. The party starts at 10pm with DJs Soo, Sparky, Katsy Lee, Curse & Blass and more. You may know HiteJinro because of it’s Soju which has been distributed in the Philippines for over 30 years in many Bars, Clubs and Restaurants. Hite Beer has been distributed in the Philippines since 2015. During this Christmas event visitors can try these Hite products for a special price of 120 php.